Ed Wood is a 1994 American biographical period comedy-drama film directed and produced by Tim Burton, and starring Johnny Depp as cult filmmaker Ed Wood. The film concerns the period in Wood's life when he made his best-known films as well as his relationship with actor Bela Lugosi, played by Martin Landau. Sarah Jessica Parker, Patricia Arquette, Jeffrey Jones, Lisa Marie, and Bill Murray are among the supporting cast. The film was conceived by writers Scott Alexander and Larry Karaszewski when they were students at the USC School of Cinematic Arts. Irritated at being thought of solely as writers for family films with their work on Problem Child and its sequel, Alexander and Karaszewski struck a deal with Burton and Denise Di Novi to produce the Ed Wood biopic, and Michael Lehmann as director. Due to scheduling conflicts with Airheads, Lehmann had to vacate the director's position, which was taken over by Burton. Ed Wood was originally in development at Columbia Pictures, but the studio put the film in 'turnaround' over Burton's decision to shoot in black-and-white. 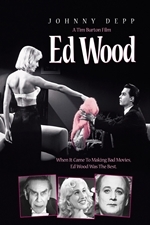 Ed Wood was taken to the Walt Disney Studios, which produced the film through the studio's Touchstone Pictures division. The film was released to critical acclaim, but was a box office bomb, making only $5.9 million against an $18 million budget. It won two Academy Awards: Best Supporting Actor for Landau and Best Makeup for Rick Baker (who designed Landau's prosthetic makeup), Ve Neill and Yolanda Toussieng.